A lengthy Dallas Morning News article March 14 offers readers collision repairers’ scathing criticisms of aftermarket parts and low labor rates mandated by insurers. 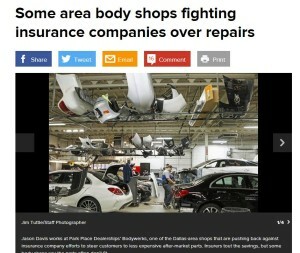 The article, probably the most in-depth coverage since the notorious “Anderson Cooper 360” segment, also looks at the history of direct repair programs whose influence many auto body shops have grown to regret. Shops in the network must agree to do the work at a prescribed hourly rate — $44 an hour in the Dallas area, McKenzie said. That amount is intended to cover the shop’s overhead as well as the tech’s wages. “Just as a way of comparison, most lawn mower shops get $80 an hour,” McKenzie said. It then follows up with the point that non-network shops are being forced to accept rates in that range too. “They just tell you, ‘Everyone else accepts that rate. Why can’t you?’” Auto Body Association of Texas President Burl Richards told the newspaper. Richards, the owner of Henderson, Texas-based Burl’s Collision Center, also said that the insurers are forcing those rates even if a shop has invested in better equipment and experienced techs worthy of higher rates. The Morning News noted that Texas Department of Insurance and lawmakers haven’t shown interest in the association’s attempts to bring them into the fight. The article also mentions the various lawsuits being filed against insurers in a multi-district litigation spanning multiple states. Texas so far hasn’t joined the case, according to the Morning News. The Dallas Morning News also unsuccessfully sought comment from multi-shop operators Service King and Caliber Collision, which are both headquartered in Texas, over their acceptance of DRPs to get volume. State Farm, the only insurer quoted, told the Dallas Morning News DRPs save money. It also said it stopped requiring aftermarket parts in most repairs — though the article also mentions that the company was sued over that years ago. The piece also points out other complaints shops have about insurers, including refusals to pay for blending a painted area with the rest of the car and the implication that guarantees are available at DRP shops only. “Every reputable shop guarantees their repairs for life. It is just feel-good talk,” McKenzie told the newspaper. Aftermarket parts themselves were criticized for not fitting and thereby requiring more effort to install. We’ve requested comment from the Auto Care Association, but much of their media department was traveling Monday.